Margaret of Parma: regent of the Netherlands 1559-1567; was born 28 December 1522, the natural daughter of Emperor Charles V and his mistress, Johanna Maria van der Gheynst. Margaret was raised by her great-aunt, Margaret of Austria, and her aunt, Maria of Habsburg, both governors of the Netherlands. Margaret governed in the name of her half brother Philip II of Spain when Philip left for Spain in 1559, and governed until her resignation in 1567 in favor of Ferdinand Alvarez de Toledo, Duke of Alba. Margaret died 18 January 1586. Following the policy of her predecessor, Maria of Habsburg, Margaret vigorously opposed the rise of heresy, though less consistently than Philip. In general her conduct of the government lacked independence and was influenced by all sorts of moods and opinions. At first she was under the staunchly Catholic influence of Cardinal Granvelle, and absolutely refused to lighten the persecution of heretics. After his departure she expressed the opinion that it was enough to punish those who caused insurrection, held secret meetings, or possessed bad books. She asked the king to pardon the Anabaptists imprisoned at Utrecht, Middelburg, and other places, if they would recant. When the king refused to spare their lives she ordered their execution in December 1565, at the same time expressing her opinion that such measures were harmful. On 20 August 1565 she wrote a letter to Count John de Ligne, Duke of Aremberg, stadholder of Friesland, urging him to keep a watchful eye on the Anabaptists and other sects. In December 1567, when Alba came, she left the Netherlands protesting against the harsh measures which he was instructed to execute against the "heretics." Hege, Christian and Christian Neff. Mennonitisches Lexikon, 4 vols. Frankfurt & Weierhof: Hege; Karlsruhe: Schneider, 1913-1967: v. II, 626; v. III, 35 f.
Neff, Christian and Richard D. Thiessen. "Margaret of Austria, Duchess of Parma, Regent of the Netherlands (1522-1586)." Global Anabaptist Mennonite Encyclopedia Online. December 2007. Web. 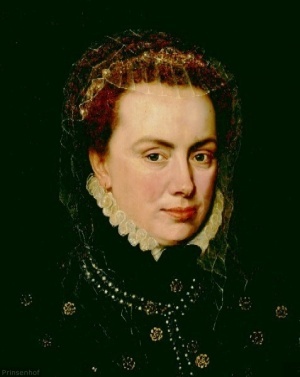 20 Apr 2019. http://gameo.org/index.php?title=Margaret_of_Austria,_Duchess_of_Parma,_Regent_of_the_Netherlands_(1522-1586)&oldid=92581. Neff, Christian and Richard D. Thiessen. (December 2007). Margaret of Austria, Duchess of Parma, Regent of the Netherlands (1522-1586). Global Anabaptist Mennonite Encyclopedia Online. Retrieved 20 April 2019, from http://gameo.org/index.php?title=Margaret_of_Austria,_Duchess_of_Parma,_Regent_of_the_Netherlands_(1522-1586)&oldid=92581.